(NewsUSA) - According to consumer data from 2011, 87 percent of polled shoppers believe that small businesses are a critical component to economic health in the U.S. That 87 percent is spot-on. Small businesses employ nearly half of all private-sector workers and provide 42.9 percent of the private-sector payroll. In addition to generating jobs, thriving locally owned establishments raise real estate values and stimulate entire communities. 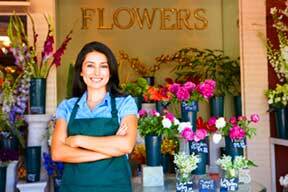 For instance, Pam Maurer of Colts Neck, N.J., helps invigorate her neighborhood through her independent flower shop. Colts Neck Florist and Greenhouse Gallery in Monmouth County, N.J., is a local favorite, often supplying floral arrangements to high-profile people in the horse racing industry such as retired Hall of Fame jockey Julie Krone. In solidarity and in celebration of the communal benefits of small businesses, Pam participates in Small Business Saturday -- the Saturday between Black Friday and Cyber Monday where communities honor small business by shopping local. Since last year's celebration was a nationwide success, Pam is eagerly anticipating this year's SBS event on Nov. 24. SBS originated in 2010, and it has rapidly accumulated some clout. During the first Small Business Saturday, participating retailers saw a 28 percent rise in sales, compared to previous years that didn't celebrate SBS. Now, two years later, it promises to be even bigger as more shoppers, communities and businesses learn about a chance to support independent shops -- and start crossing off items on the holiday gift list. Small businesses like Pam's have always helped local communities thrive. Because local businesses recycle money through the community and create jobs, they boost the economy more than chain stores or retailers that aren't locally owned. Data from the American Express Independent Retail Index suggest that strong local businesses even lead to greater property values for homeowners. The report discovered the home values in 27 different neighborhoods with booming independent businesses outperformed their broader markets by 50 percent over the last 14 years. To sign up or learn more about participating in SBS on Nov. 24, visit www.shopsmall.com. Shopping at independently owned stores boosts your local economy.